Music: “Mr. Popeil” from Permanent Record: Al In The Box by “Weird Al” Yankovic. Released: 1998. When I was growing up, my Mom didn’t have all of the latest kitchen gadgets, but I do remember some of them. I recently purchased a copy of ‘But, Wait! 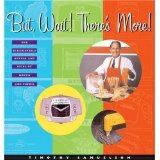 There’s More!’, written by Timothy Samuelson, about ‘The Irresistible Appeal and Spiel of Ronco and Popeil’. Back in the early 1950’s, Ron Popeil, son of Samuel J. Popeil, began inventing really useful kitchen gadgets to save the homemaker time: “Kitchen Magician”, “Chop-O-Matic”, “Dial-O-Matic Food Cutter” and more. Reading Samuelson’s book was pure nostalgia. 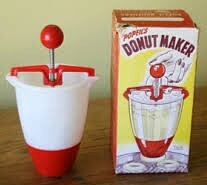 I remember that my Mom had ‘Popeil’s Donut Maker’, even though she rarely made donuts. She also had the “Chop-O-Matic”, which was a nifty gadget that chopped vegetables, nuts, etc. She never let my sister or I near it, though, which was fine with me. With its very sharp ‘rotating stainless steel blades’, you could do some serious damage to small fingers, especially if your sibling was mad at you. She never progressed to the wonderful “Veg-O-Matic“, much to my disappointment. According to the ads, in one minute, you could produce 10,000 miniature dice potatoes, 300 onion slices or 700 French Fries! Wow! How can you beat that for speed and efficiency? Much later on, Ron added new lines to his gadgets, many of which were not kitchen products, manufactured under his firm, Ronco Teleproducts: “Ronco Cordless Electric Miracle Broom”, “Ronco Outside Inside Magnetic Window Washer”, “Buttoneer”, “Cordless Electric Smokeless Ashtray” and many more. But it is the kitchen products I remember the most. In 1998 came the “Showtime Rotisserie & BBQ”, modeled after his earlier 1950’s version, the “Roto-Broil” rotisserie. Ron Popeil demonstrating yet another of his kitchen time-savers! How many Ron Popeil kitchen gadgets and appliances did your Mom have? Did she have the “Mince-O-Matic Seven”? The “Whip-O-Matic”? The “Grate ‘n Shred”? How about the “Veg-O-Matic”? (you remember the one: it slices! It dices! ‘Saves the housewife hundreds of food-preparation hours!’) The “Egg Scrambler”? (scrambles the egg, while still inside the shell. How cool is that?) “Automatic Pasta Maker”? “Potato Chip Machine”? There’s no question that Ron Popeil changed the cooking habits of many home cooks from the 1950’s right through the 1990’s. A master pitchman and a master inventor! 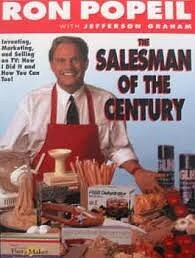 Ron Popeil, ‘Salesman of the Century’ ! This entry was posted in Cookbooks, Cooking, Cooking and Social History, Cooking Technology, Eating, Food Fads, Food Trends, Uncategorized and tagged Chop-O-Matic, cookbooks, Cooking, Donut Maker, Kitchen Appliances, Kitchen Gadgets, Ron Popeil, Ronco, Showtime Rotisserie, social history, time capsules, Veg-O-Matic. Bookmark the permalink.